Since 1 July 2017 government entities have also been subject to reporting requirements – see details here. For businesses in the Building and Construction industry, there has been an annual requirement for reporting of payments made to contractors providing building and construction services as from 1 July 2012. Cleaning and courier services are included in the reporting regime from 1 July 2018. The final legislation includes an amendment to exempt entities from the reporting requirements if the total amount of courier or cleaning services payments received are less than 10% of the entity’s GST turnover. A proposal set forth in the 2018 budget includes ‘road freight’, ‘IT’, ‘security, investigation or surveillance’ services in the reporting regime starting from 1 July 2019. Legislation has been approved by parliament with the first annual report due 28 August 2020. Treasury Laws Amendment (Black Economy Taskforce Measures No. 2) Bill 2018. The requirement is to lodge an annual summary of payments, with sub-totals for each contractor paid. The Taxable payments reporting requirements operate as an integrity measure, with the Tax Office using the information for data matching; i.e. to compare the reports data with income reported by the contractors in their tax returns. Returns are required on a cash basis, which will create reconciliation issues if an accruals basis of accounting is adopted for other purposes – something the Tax Office has previously publicly stated will be taken into account. No separate registration is required, so no “nil” returns are required. However from a compliance point of view, the Tax Office is able to check up on businesses by cross-checking the industry code in their annual tax return. This requirement only applies where non-incidental services are provided as part of the contractor’s invoice; materials-only invoices do not need to be reported. This requirement is not affected by the business structure of the payee. Payments made to labour hire firms are not caught, and payments caught under other PAYG provisions (such as wages) are of course excluded. If tax is withheld (for example if a valid ABN is not provided by the supplier) the amount withheld will be included in the taxable payments report. 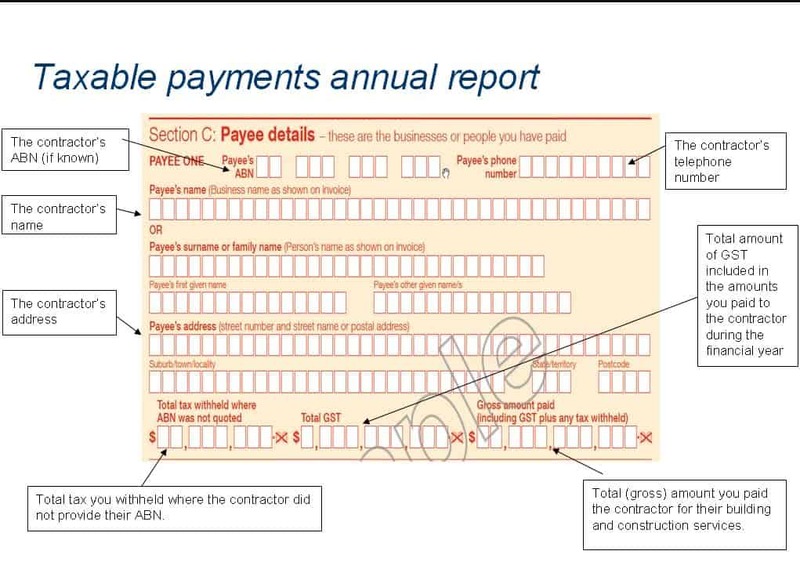 The taxable payments annual report is due to be lodged by 28 August each year. For manual summary preparers, an example worksheet (PDF) has been made available. The annual reports are prepared on a cash basis regardless of your BAS method or status. In this way it is similar to the employee PAYG requirements). To be subject to the reporting requirements, there are some important definitions. ‘Primarily building and construction’ has a 50% threshold for current and previous year GST turnover – see how to calculate this here. Cleaning and courier services: If the total payments received for cleaning services are less than 10% of GST turnover a report is not required. There are a number of reasons why a report may not be required to be lodged. Notifying the Tax Office will prevent unnecessary follow up actions. Non-lodgement reasons and forms are here.